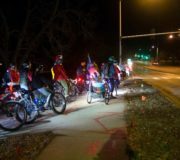 Way to keep riding after the challenge Lincoln & Nebraska! Each month we’ll be recognizing riders and groups in Lincoln and across the state in the following categories. If you know any of these folks, congratulate ’em for their October efforts!